In order to minimize the risks for productive SAP systems, companies are increasingly turning to 5-system landscapes. In this case, classic 3-system landscapes (DEV, QAS, PRD) are being extended by an additional release landscape with a development system (DEV ‘) and a quality assurance system (QAS’). 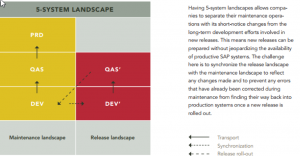 Parallel SAP development landscapes make it possible to separate the maintenance landscape with its short-term corrections from the longer-term development landscape for a new release. This allows you to work on a new release without jeopardizing the productive SAP landscape. It is important to synchronize changes in the maintenance landscape with the changes in the release landscape. Therefore, errors that have already been corrected in the maintenance landscape are not returned to the production landscape during the later release roll-out. The Synchronization Management module of theGuard! SmartChange makes it possible to synchronize parallel SAP development landscapes simply, reliably and automatically. Synchronization Management provides a full audit trail and easy reporting for meeting compliance requirements. The solution integrates seamlessly with SAP and analyzes all Workbench and Customizing objects that leave the development system of the maintenance landscape when a transport request is released and exported. These are then automatically categorized into “non-critical” and “critical” objects – depending on whether they can be synchronized from the development landscape to the release landscape simply by means of a transport, or whether they require manual synchronization within the release landscape. The results of the object analysis are presented in an overview. From here, users can package all objects that can be automatically synchronized by means of a transport into a single synchronization request. In order to accelerate the comparison and synchronization of any remaining Workbench objects that require manual intervention, users are provided with the corresponding, object-specific delta views. The Customizing analysis provides a detailed overview of any differences in Customizing objects, views and tables. The Synchronization Management module in theGuard! SmartChange provides maximum automation, enabling you to minimize the need for manual intervention when synchronizing development systems and to free up valuable resources. Built-in checks, for example to identify dependencies between objects, are available to improve the security and quality of the synchronization process. The synchronization progress is displayed in the respective dashboard and any changes are logged to provide a full audit trail.